How do I fit the Hotwire ECU chip? Below you will find descriptions of how to find your Hotwire 14CUX ECU depending on what vehicle you have and also a PDF file of the instructions supplied with our chips. OK so for starters you need to locate your ECU, simple on some vehicles a little bit more trick on others if you are not sure what you are looking for as there can be some many. However in all cases the 14CUX ECU is black with one large multiplug connector plugged into it. Note before removing any ECU, ensure the keys are removed from the ignition, then disconnect the negative terminal on the cars battery. When reconnecting the battery ensure that the keys are out of the car as many modern alarm systems will lock there doors as soon as the battery is connected. You will find the Hotwire ECU located under the right hand front seat, so that's the drivers seat on right hand drive vehicles. This is normally located by the A pillar in the footwell on the right hand side of the car and is hidden by the plastic kick panel that removes simply by pulling away the door seal. Located in the left hand foot well, the best way to find this is to look in the passenger footwell and then look up as it is on the underside of the bulk head. It is sometimes a two person job to remove this as the bolts holding it in place need to be accesses from under the bonnet to stop them from spinning. If your MGR V8 has air conditioning (as most do) then your ECU is located in the left hand footwell behind the air conditioning unit. If you look closely you will be able to see the lower edge of this and also the small 8mm bolt that fixes the holder of the ECU in place. Located in the passenger footwell behind the battery, this should be easy enough to find and whilst in the area of the battery check for terminal corrosion as this is something quite common that we find in this area. As the Hotwire system was also used on many Kit Cars as it is such a good fuel injection system it might be necessary to chase the main loom from the engine to find where your ECU is. We have found on some Marcos's the ECU is buried deep in behind the dash board, often not actually fixed in place but surrounded by dash wiring looms. 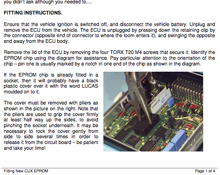 Hotwire ECU Chip fitting instructions. We do not yet have a video of how to fit a Hotwire ECU chip however when it is available a link will be placed here.